All puppies come with a State of Florida Health Certificate. Puppies are not released until 8 weeks old. All shots are up to date when the puppy leaves. Dedicated to providing superior value to our customers by producing the best moderately priced German Shepherd available anywhere. Commitment to the highest principles of business practice. Your satisfaction is our priority. Approximately 30% of our sales are now generated through repeat customers and word of mouth referrals. Dedication to the future of this magnificent breed. Passionate about our dogs and puppies as individual animals. We believe the time we spend providing our dogs love and social interaction gives our customers a superior dog as well as ensuring a great quality of life for our dogs. This is also the most enjoyable part of our work. A desire to maintain and improve the professional standing of the larger breeding community. The Health of our dogs is fully guaranteed for one year. If there is a significant veterinary certified health problem with any of our dogs you may return the dog to us with a copy of the veterinary examination and you will receive a full refund or a replacement puppy. 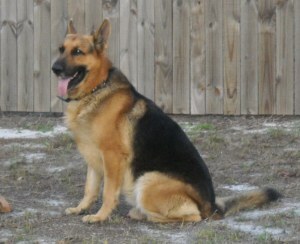 Central Florida German Shepherds reserves the right to have the dog examined by our veterinarian. This guarantee covers all Breeder related defects. Your Satisfaction is our absolute priority! The German Shepherd is a working dog developed originally for herding and guarding sheep. Because of its strength, intelligence and abilities in obedience training it is often employed in police and military roles around the world. General good health indicators- Coat, teeth and gums, tongue eyes etc. 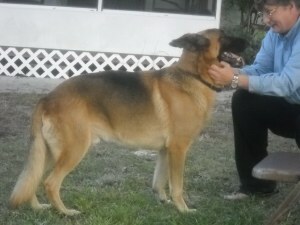 Central Florida German Shepherds is an AKC inspected and 100% AKC compliant breeder. AKC Certificate of Inspection and Inspection Report are on file at CFGS and are made abailable at customer request.